PREPARING for the Larchmont Family Fair are (princess) Nikka Gueler, Luke and T.J. Brunelle, Sam and Max Terr. In the back row are Vivian Gueler and Betsy Malloy, co-chairmen, and John Winther, Larchmont Boulevard Assoc. president. Photo by Bill Devlin. 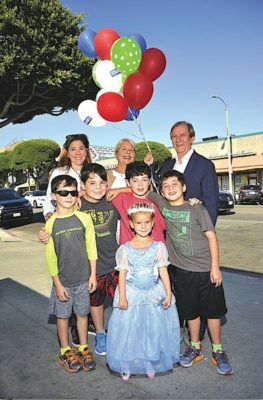 The Boulevard’s largest event of the year — the Larchmont Family Fair — is returning bigger and better than ever, while staying true to its small-town roots. The fair will take place on Sun., Oct. 30 from noon to 5:30 p.m.
New attractions and old favorites will be featured, including the children’s costume contest, “Larchmont’s Got Talent” show and pie-baking and pie-eating contests. Rides include a synthetic ice skating rink and bubble rollers, camel and pony rides, slides and kids’ cars. A petting zoo and food booths are also featured. Winners of the talent show contest will reap $500, $300 and $200 for first, second and third place respectively. The contest is open to amateurs of all ages and categories include singing, dancing, comedy, gymnastics, instruments and bands. “There are no limitations,” said fair co-chair Vivian Gueler. Music composer and local resident Stephen Endelman returns as master of ceremonies for the talent show. Tryouts for the talent show are on Sun., Oct. 23 from 10 a.m. to 3 p.m. at Coldwell Banker, 251 N. Larchmont. Larchmont-based acupuncturist Jim Bloomfield will judge. • 12:30 p.m. – Pies are due for the pie baking contest. • 1:00 p.m. – Costume contest. • 2:30 p.m. – Talent show. • 4:00 p.m. – Pie-eating contest. The talent contest is sponsored by Keller Williams and the Larchmont Boulevard Association. The Fair supports local schools, scout troops, service clubs and religious and other charitable groups. Send sponsorship inquiries and requests to vgueler@pacifictrustgroup.com. In behalf of the Knights of Columbus, Hollywood Council #2406, we wish to get involve with the Family Festival. Please email me: bjavelo@gmail.com on the way we can participate with exclusive booth serving some Food & Drinks during the Fair & the way you can be benefited with our participation. We will treat it as part Community Service as all Knights Brotehrs will be at the Fair sharing our ideas on how thw Knights of Columbus can be of help to Larchmont Village Community, which near by Christ the King Church & School. The other way is to write them “snail mail” at Larchmont Boulevard Association, Inc., 419 N. Larchmont Blvd., PMB 222, Los Angeles, CA 90004. Thanks, Rachel! Since, there’s a limited left before the Fair date, Oct. 30, 2018, our KC Board of Directors was not able to discuss such possible involvement this year. Most likely we will consider this on the next Fraternal Year in 2019? Thanks for your immediate reply and please bear with me not to reply soon since, we’re in the process of holding our Fraternal Year’s Installations of Officers that only happened a month ago.